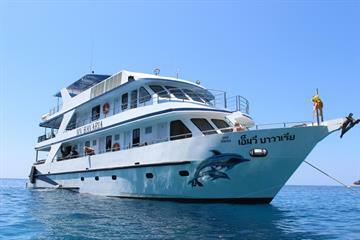 Myanmar liveaboards to Western Rocky offer some of the best cavern and wall diving you can imagine. Western Rocky itself is just about 60 metres wide with 2 smaller islets to the east. Dive cruises in Myanmar offer spectacular diving here. These islets can be dived as separate dive tours or can be reached underwater from the main island. Starting the dive at about 12m below the surface, this dive site consists of a large plateau. On top you'll notice the thick carpet of purple soft corals that cover most of this dive site. A rare and above all beautiful sight! From the plateau finger-shaped reefs stretch out into the deeper water to a maximum depth of close to 40m. Currents permitting, it is possible to swim all the way around throughout a dive, but you can also find shelter from the current, if needed, and still have plenty of reef to explore to last a whole dive. At the end of the dive just ascend to 5m, deploy your surface marker and drift along as you watch out for larger pelagics. At the surface your liveaboard crew will be waiting to take you back to your dive boat. Diving from a liveaboard on the southern wall there is a large cavern that starts at 5 metres below the surface and drops to 25 metres. On the western side of the cavern is a large archway swim-through window, letting sunlight stream. East of the cavern you find the entrance to a tunnel that runs right through the centre of the island and exits on the northern side. There is a large chamber inside and as the tunnel reaches the northern side it gradually narrows so that divers must progress in single file. The dive starts at 17 metres depth down to maximum depth of 24 metres, allowing to see daylight (just) for the whole 30 metres through the tunnel. The tunnel splits into 2 exit passages that open to a fringing reef at a depth of 21 metres. The passage to the right is the larger of the 2 exits. The left passage may require you to remove your scuba dive unit to squeeze through. A torch is recommended tot take and explore the darker ledges of the tunnel. The tunnel is a prime example of how marine life prospers when out of the reach of fishermen. Everything inside the cave is big, most notably gigantic lobster and very fat nurse sharks. One chubby nurse shark, about 3 metres long, may make it impossible for you to make it through the tunnel, instead you'll have to turn around and exit the way you entered. If you exit the tunnel on the north side the prettiest section of the dive site is to the left, on the western tip of the island. Here you can enjoy looking at anemones and pore corals proliferate with a myriad of fish life, including thousands of glassfish being hunted by trevally. Fimbriated moray eels are common and banded sea snakes can be seen. The Mergui Archipelago's southernmost dive site, Western Rocky offers liveaboard divers an overwhelming choice of wall diving, reef diving, pinnacles and an impressive passage through the centre of the island. Marine life ranges from the tiniest nudibranch to occasional whale shark visits. The cavern walls and ceiling are covered in zigzag clams, encrusting sponges and spinous sponges. Shrimps, crabs and lobster are numerous in the crevices and common lionfish are also present. 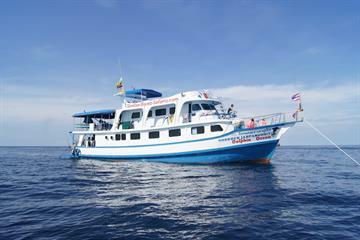 The south wall also makes an excellent night dive on your liveaboard trip. Red finger soft coral and orange cup coral provide the colour. Brown spiny lobsters and painted rock lobster are more numerous here than at any other Burma dive site and are often seen out of their crevices displaying their full length. Long haired hermit crabs, scaled hermit and giant crabs, plus sponge and decorator crabs are all present, as are wandering cowries and if you are eagle-eyed, angler fish. There are 4 small pinnacles to the east of the main island. Definitely dive in if you want to see some cuttlefish or big reef squids. Or check out some bearded scorpionfish or twin spot lionfish, various moray eels, including yellow margined, white-eyed and spot-faced morays. These islets can be reached from the eastern tip of the main island, when good visibility and currents allow. They are worth a dive on their own too. Pelagics like jacks, mackerel and chevron barracuda patrol these blue waters. As you make your way over the lilac reef you will see that there is no shortage of life among the hard corals and rocky substrate. Numerous cracks and crevasses provide shelter to different types of moray eels whose heads stretch outwards, their jaws wafting oxygen rich water over their gills. You can also spot all manner of shrimps and other creatures that prefer to stay out of sight of predator animals. At the section of the reef that extends out from the plateau from the north-western area to the south-eastern corner of the dive site, you will see large schools of snappers and also jacks and mackerel on the prowl. Western Rocky Pinnacle is located about 500m southwest of the main island. 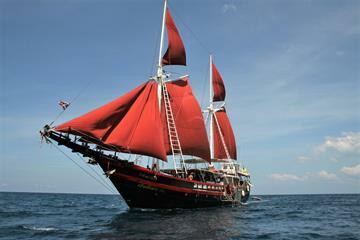 The best way to get to Western Rocky is on a Myanmar liveaboard dive cruise. Bangkok Airways operate direct flight from Bangkok to Ranong, which has a port on the Thai side of the Myanmar border. This is the nearest departure port/location. You can take a taxi from Ranong Airport to the port of departure. Your starting point for your luxury liveaboard safari of a lifetime. Yangon International Airport is the main hub for domestic flights. Local airlines include Air Bagan and Myanmar National Airlines. It's cheaper and easier to book domestic flights via agencies once you are in Myanmar. There are no international car-rental agencies, most travel agencies in Yangon, Mandalay and Bagan - as well as guesthouses and hotels elsewhere - can arrange cars and drivers. Nice arch and pass-through cave. Unfortunately the visibility was very low. But there was plenty of corals and small fish and general sea life!